size to no more than 1280mm x 1280mm. 1100mm x 1100mm - Final Internal dimensions of cut-out hole in roof. 1280mm x 1280mm - External dimension of finished upstand. 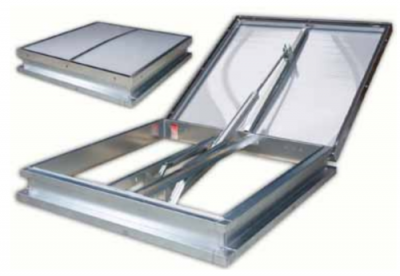 This automatic smoke exhaust vent is a 140° opening lid-type leaf designed with the primary function of evacuating smoke, fire fumes, and thermal energy from inside buildings to the outside, thus contributing to protection of life and property. It comes in a standardised 1100mm x 1100mm size, but can also be customised to your specific bespoke dimensions. It is fitted with an electro mechanical actuator and the entire vent/operator system is EN12101-2 certifed.